Many officers have asked me to make special cases or projects for them. Normally I will listen to the request and talk it over to understand what the person wants. Afterwards I will provide a price quote, and if agreed, I will make it, but its understood that I will retain the rights to the idea. Below are examples of some ideas. 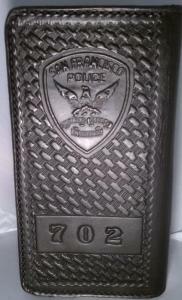 Pictured is an example of a custom made citation book for a San Francisco Police Officer. The book is made of 8oz holster leather, inside and outside, but it's small enough to fit in the back pocket during foot patrol. The citation book can be as large/thick as the standard ones sold at the uniform stores, or as small as the one pictured. Please note, there is a $60.00 dollar set up-fee to get your department logo stamp made. This price is for a stamp similar to the San Mateo County Sheriff's Office stamp (Refer to picture below). For the SFPD style stamp, the set-up fee is $100 dollars. 1. If four members of your department place orders, I will wave the set-up fee and pay for the stamp myself (a stamp similar to the San Mateo County Sheriff's Office stamp). 2. If you prefer a stamp similar to the SFPD stamp, I will need at least six orders to waive the set-up fee. Shipping and taxes (if applicable) are not included in the price. Please email me for a quote. Leather, custom made Guncase for a Ruger .380. Case is designed to give the appearence of a handcuff case, but houses a Ruger .380 caliber compact firearm. Leather holster, leather back-wall attached with velcro. Holster can be placed on the leather back-wall at any desired position. The unit can then be placed inside any pocket as a whole to reduce movement of the firearm. Custom Sheath for a 511 knife. Custom leather sheath for 5.11 knife. Sheath is made of 6 to 8 oz leather, designed for the duty belt. 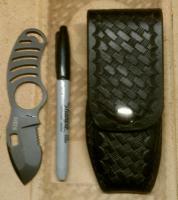 This custom knife sheath is worn under the duty belt. The belt loop attaches to your regular belt, worn under the duty belt freeing up space. Open top, small-of-back double handcuff case.